Walking Through Time with Indiana Jones was held May 10, 2008. Click here to find out how things went!! Check out the facilities at Roper Mountain Science Center where Walking Through Time with Indiana Jones will be held. Dr. Reynolds will be presenting an exciting program entitled The Archaeology of Indiana Jones that uses Indy’s adventures as a vehicle for learning about authentic archaeology. Archaeologist, consultant, space expert, best-selling author of nine books, and the current director of the Phaeton Group, Dr. Reynolds brings a vast amount of knowledge and experience to share with visitors. 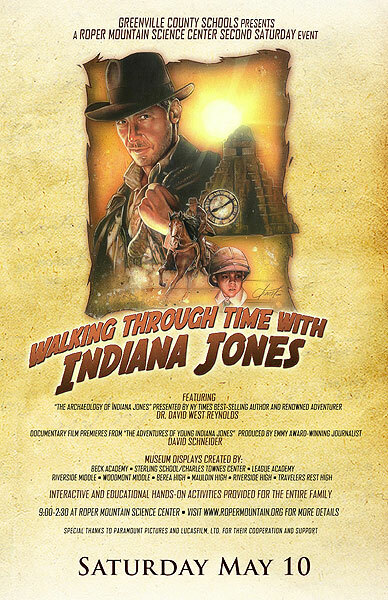 Walking through Time with Indiana Jones is a project resulting in an exhibition that requires students to research and create museum-style displays based on a variety of cross-curricular topics. Throughout his life, Indy comes into contact with a number of historical figures and witnesses events that will shape the Twentieth Century. These encounters have been divided into numerous themes for student investigation. A class (or classes) will select a theme, research all aspects of it, determine its historical significance, identify its major players, and then create a display that includes artifacts, documents and other visuals that will aid in illustrating. It is the responsibility of a class (or classes) of students to select one of these themes and thoroughly research that theme. Such research will be carried out under the supervision of the teacher and with the assistance of the project manager and project scholar. Libraries and Internet sites such as online collections of documents and photos will be utilized as part of the research process. Students and their teacher will decide upon the artifacts that will be displayed, the text that will be written to describe the events and any documents or photographs that support theme as well. All suggested content for the exhibition will be reviewed by the project manager as well as the project scholar. Classes may work on the project during the course of the year, striving to complete their research in stages to meet set deadlines provided by the project manager. Project standards and benchmarks will be used in order to enhance the accuracy and quality of the completed exhibition. Learn more about Walking Through Time with Indiana Jones by reading the Complete Exhibition Overview (3.5mb). Check out the facility at Roper Mountain Science Center where Walking Through Time with Indiana Jones will be held May 9-10. We would like to thank the following people for their participation and support. David Schneider of Lucasfilm, Ltd.